Thanks to you, we have met our match! WASHINGTON – In partnership with the National Association of Counties, the National Flag Foundation and the National Sheriffs Association, Berks County has installed a flag retirement box, at no cost to the county, at the County Services Center Main Floor Lobby. Flags should be folded respectfully before being placed in the box. On Thursday, November 9th, 2017 at 11a.m., the Berks County Commissioners, Berks County Department of Veterans Affairs and Sheriff Eric Weaknecht will formally locate this new U.S. Flag Disposal Box in the lobby of the Berks County Services Center. Brief comments will be made. The United States Flag Code prescribes flag etiquette — everything from flying it near other flags to instructions on how to raise and lower it. “The flag, when it is in such condition that it is no longer a fitting emblem for display should be destroyed in a dignified way, preferably by burning,” says the code. 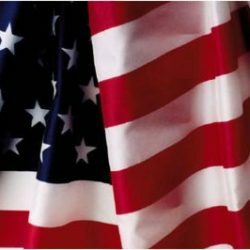 The Berks County Veterans Affairs Department will be responsible for the proper disposal of the worn flags. “Making it easy for citizens to properly dispose of worn U.S. flags is the right thing to do. This box is provided free through the National Association of Counties,” said Berks County Commissioner Christian Leinbach.